35/8, 35/9, 35/2(part), 35/3(part), 35/4 and 35/7(part). The Spanish Point discovery (IRL35/8-2) was drilled by Phillips Petroleum in 1981, and flowed circa 1,000 barrels of oil per day (BOPD) and 5 million standard feet of gas per day (MMscf/d) from Upper Jurassic sandstones. 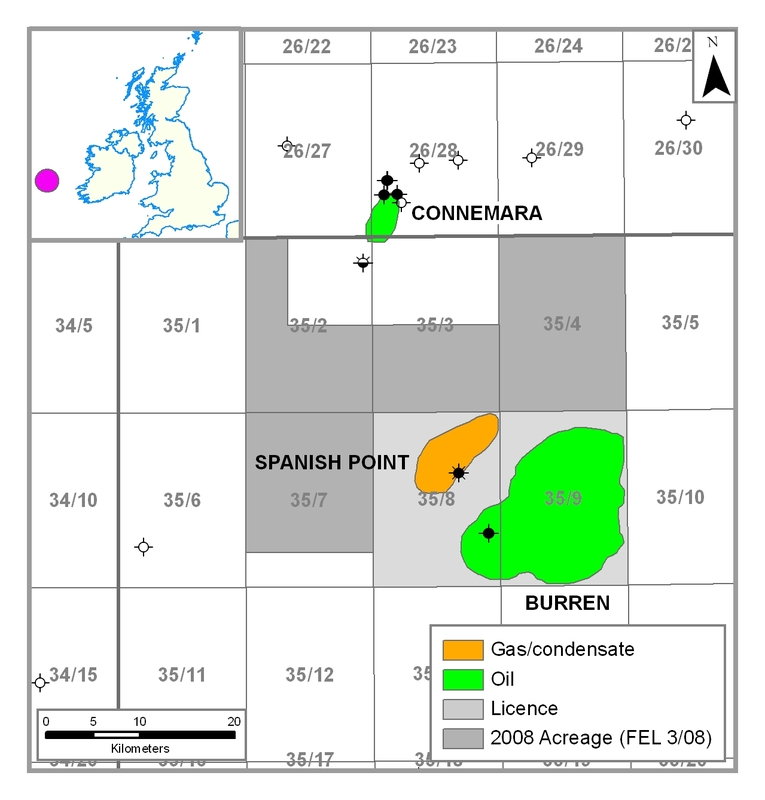 A 3D seismic survey programme was acquired in 2009, covering an area primarily over the Jurassic Spanish Point gas condensate discovery. Processing and interpretation of the seismic data are complete, which confirm the structure mapped on 2D and suggest a contingent resource of up to 200 MMboe. The recently completed reservoir simulation (static and dynamic) has modelled peak production rates at over 70,000 BOPD. 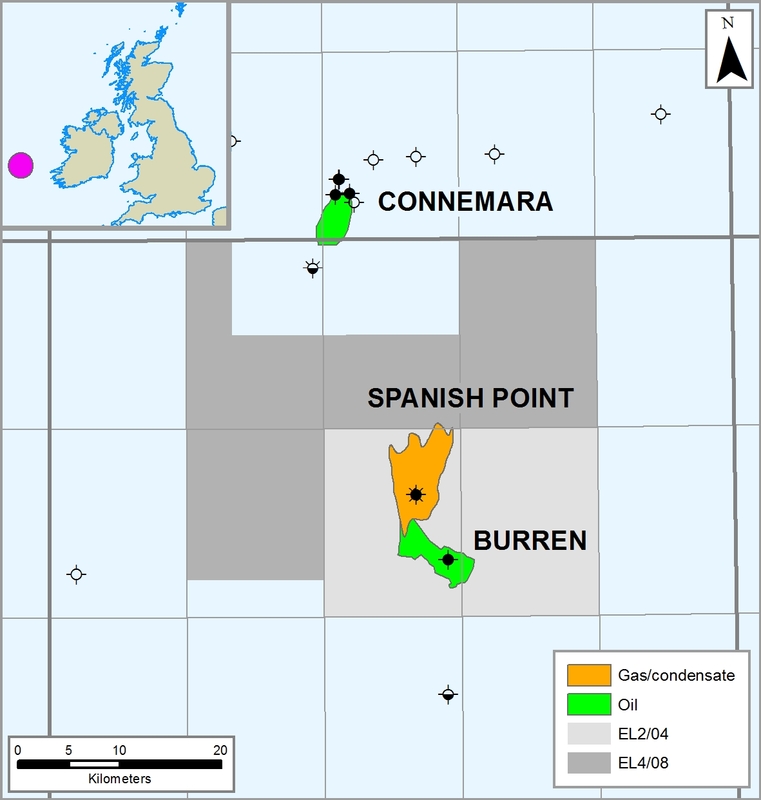 The Burren oil discovery (well IRL35/8-1) was made by Phillips Petroleum in 1978. This well encountered 34° API oil bearing Lower Cretaceous sands which tested at circa 700 BOPD. The oil is most likely trapped both structurally and stratigraphically and the sands are interpreted to thicken towards the south. Interpretation of the 3D seismic suggests prospective resources up to 66 MMbbl. aggregated prospective resources up to 680 MMboe.